Q. What is a library barcode? 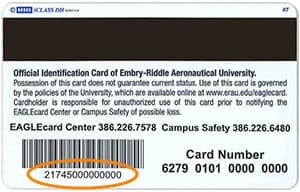 Your library barcode is the number located underneath the barcode on the back of your EAGLEcard. Worldwide students do not have a library barcode. For more information on how to find and use your library barcode, see the library's EAGLEcard page.